There are different ways to slaughter McMutants but the two we use the most involve an axe and a chopping block (with a bucket filled with water nearby), and throat slitting in a large bleach bottle. 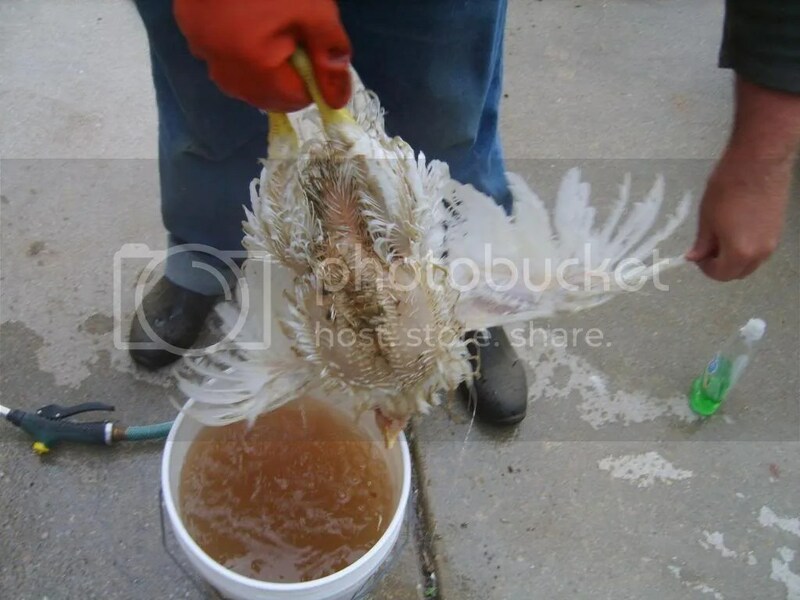 Other methods people have used on chickens in general include: drowning, clubbing and throat slitting, ripping the head off by hand, breaking the neck, and poking the brain with a sharp object shoved through the beak (which supposedly allows you to dry pluck). The method you choose will depend on how much you have invested in the process and how you plan to pluck and butcher the bird. Remember that the McMutant is…… not like your average chicken–it is heavy and grows so quickly that excessive movement can break bones. Heritage chickens like the Jersey Giant can achieve similar weights but a slower rate. On smaller McMutants (up to 10 lbs.) we stuff them in the bleach bottle and slit their throats. Being in such a confined space prevents broken bones and skin. A more upscale version of the bleach bottle is the killing cone. The larger McMutants are decapitated on an old stump. We place two nails in a V shape on the stump to hold their head in it, but keep in mind that larger McMutants will require a larger V. Yes, we actually ran into the issue of having to change the size of the V, so either keep a hammer on hand or have multiple stumps/V’s. Regardless of which method you use, there is still a chance that McMutants will break their bones. It seems like the bottle method reduces the probability of breaking bones and skin, but you still have to stuff them into the bottle, and it is possible for spiteful birds to defy you before they die. This really only matters if you want to have a nice looking bird for the table. Just remember that with the McMutant you do not want to be holding them upside down by their filthy feet for a long time. Hold them close to you so they cannot flap their wings as you transport them, then flip and slam dunk. It is easier to slam dunk in a killing cone; the bleach bottle can be difficult sometimes as you have to pull their heads through. As for plucking, we have plucked by hand and used two pluckers: a drill plucker, and the Whizbang plucker. I do not care much for the drill plucker, but there are probably ways to improve it. The Whizbang plucker is mighty! Every time we use it and see the feathers fly off of three birds in fifteen seconds or so, I think of all those long hours spent plucking by hand. Unfortunately, the Whizbang is an expensive investment. The bicycle plucker is similar to the drill plucker, and may be worth researching. Inexpensive, primitive, efficient pluckers are still of interest to me even though I use the Whizbang monster. If you pluck by hand you will probably want some kind of stand to hang the birds from because it makes it easier. We use the cords from bales of straw to hang the birds with slip knots. You will want to keep buckets of water nearby to store birds in until you can butcher them. Before you can even begin to pluck you must scald–not boil!–the bird. You will want to boil water and achieve 145-150 degrees Fahrenheit. Depending on the setup you will have lots of logistical fun. 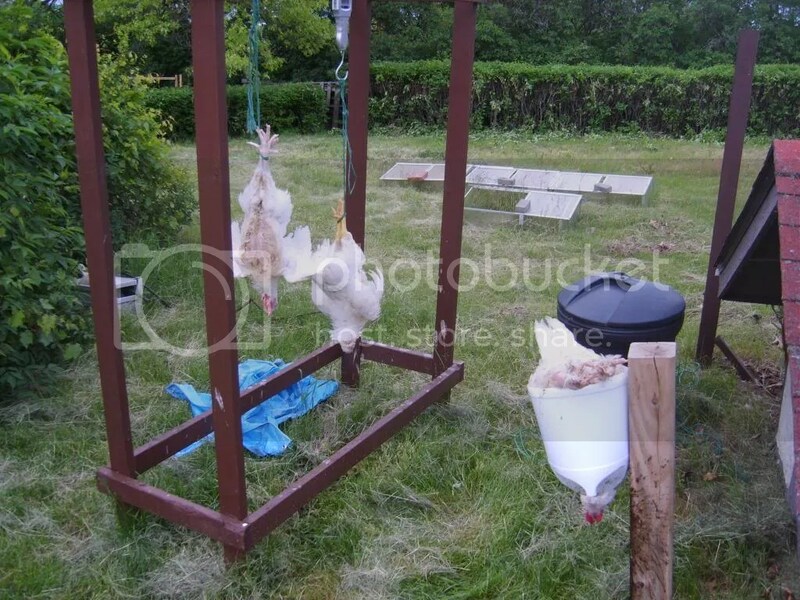 With a five gallon bucket you will only be able to scald three chickens properly. A larger pot will probably allow you to scald more birds in succession. The scalding process involves dipping the bird in the water and swishing it around for a few seconds. Test to see if the feathers are easy to remove by plucking the large wing feathers; if they do not come out easily, dip the bird again and get a nice whiff of “chicken tea”. One thing to keep in mind when thinking about raising poultry or waterfowl for food is nature’s schedule. 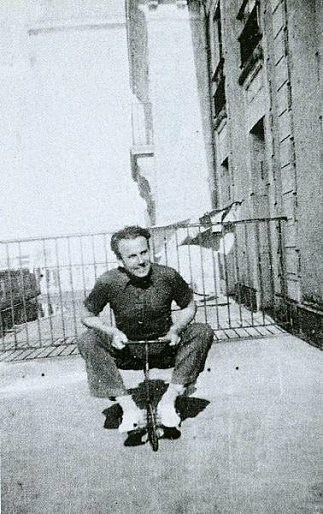 The birds have their own lives with their own little minds and ways of doing things. To a certain extent you must go with the flow in order to be efficient. The relevant aspect of this concerns molting–if you wait until your birds molt then you will have to deal with pin feathers that are hard, if not impossible to remove. Some people use blow torches and special pin knives, and some people simply do not bother. This is not necessarily a big deal; we could not completely remove feathers from the turkeys we raised last year but they tasted just fine. For McMutants, ideally would process them at eight weeks–when they crow, time to go! And when they start to crow you will want them to go because they sound like a fat man gargling sugar free chocalate pudding. When I went to the link of the wizbanger I thought to myself a washing machine would work pretty well for that and there is one on youtube. The wizbanger doesn’t rupture any of the internal organs or anything like that? lol, they even do the dishes and clean up after you. The only issue is the possibility of broken bones/skin. The wash machine is a good idea. I think you’d like James Ballou’s Makeshift Workshop books. Don’t bother with the others, they are basically the same but with less information, although Arming for the Apocalypse might have new info–haven’t read it yet. Just when I was about to eat dinner. My husband’s family would swing the chicken lasso-style until the neck snapped. 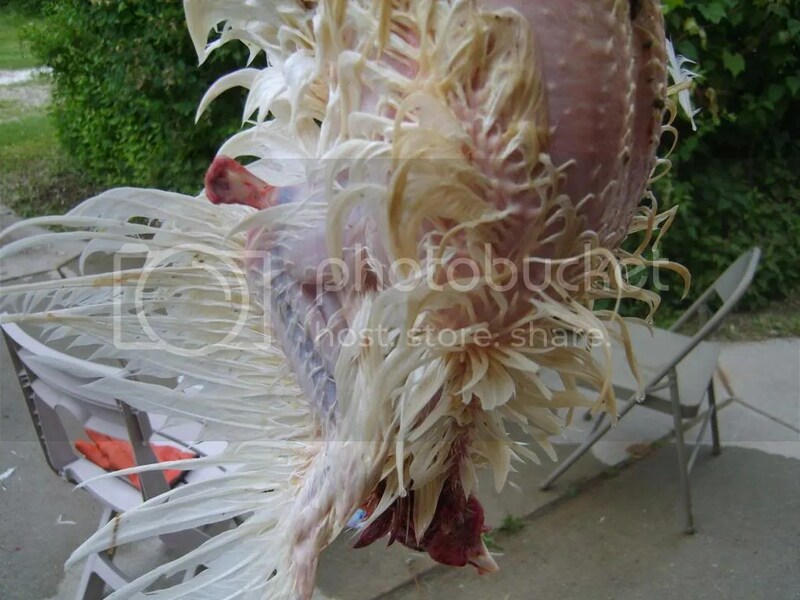 One reason kosher chickens still have some feathers after packaging, is that they can’t be scalded as much as regular birds. I think this violates the rule against cooking stuff with blood in it, even if it’s not the official cooking. Interesting, I didn’t know that. Reminds me of this bizarre question about whether playing Scrabble on the Sabbath was considered work. I can’t remember what the ruling on that was. Welcome to Eradica, islandmommy. Hopefully we won’t scare you away too soon.